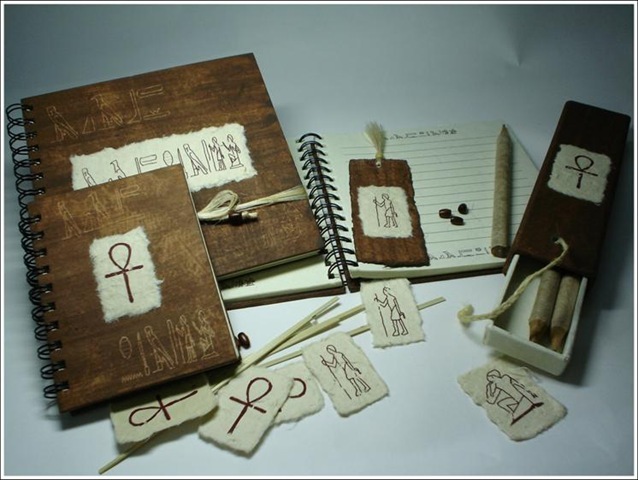 Anand Prakash presents to you “Egyptian Hieroglyphs ” – a range of limited edition gifts & stationery. Hieroglyphs have a fascinating story to tell. They are not merely a language but a gateway to understanding an entire civilization. They reflect the world view of the Egyptians and unfold the mysteries of the pharaohs. So what you see and feel transports you to the realm of ancient Egypt. 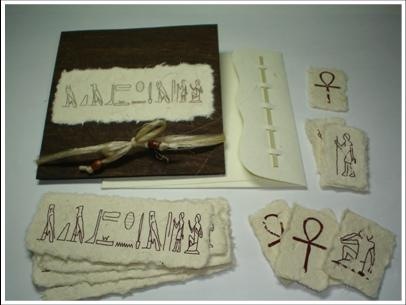 All products have hieroglyphs with its meaning in English printed at the back. 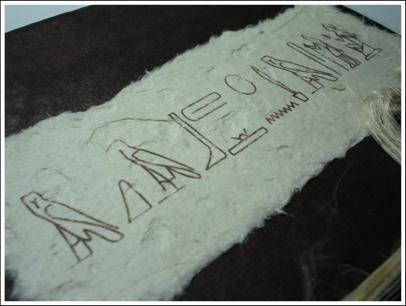 The hieroglyphs have been printed on a specially designed handmade paper that mimics a peeling wall texture. 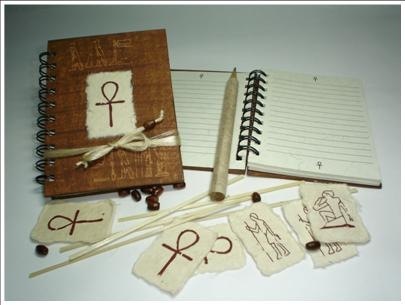 The papers that hold the hieroglyphs have been hand coated and brushed to give it that authentic look. This range has been developed after months of extensive research on hieroglyphs, papers and textures…….. Truly a collectors range. Further on we will also be launching the limited edition calendars for 2009 in this range. 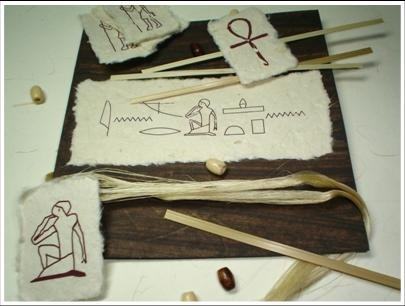 The cards were hand coated and brushed in brown, then the specially designed paper with the peeling texture and the hieroglyphs was placed over them. 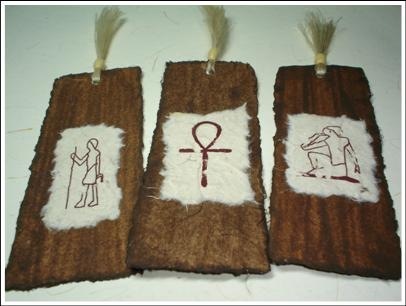 Comes in four different hieroglyphs/designs. Notebooks have ruled pages printed with hieroglyph headers and footers. 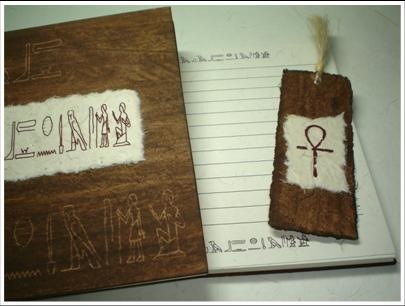 The covers were first hand coated and brushed in brown, then the hieroglyphs were etched on them by a special process and finally the specially designed paper with the peeling texture and the hieroglyphs was placed over them. 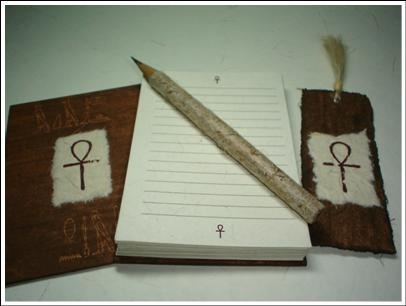 Comes with a matching complimentary bookmark with jute fiber. Each box contains three pencils. 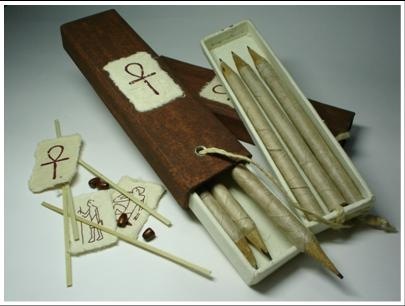 All pencils are covered with handmade paper. The box has a sliding mechanism attached to a jute string for closure. Each bookmark has gone through the same process as mentioned in the notebooks section. It has jute fiber attached with a bead at the top. They are individually packed and are available in three different hieroglyphs. 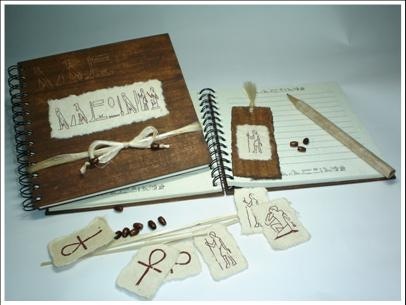 This entry was posted in Newsletters, Whats New and tagged Anand Prakash, Anandz Creation, Egypt, Egyptian Cards, Egyptian Gifts, Egyptian Hieroglyphs, Egyptian Paper, greeting cards, Handmade Cards, handmade paper, journals, Pencil Box, Textured Paper. Bookmark the permalink. ← Blog is nearly ready.